You do not need to be a rocket scientist to explain why BBC Radio 3 lost 8% of its audience during a 12 month period in which the total UK radio audience grew by 2%. Latest RAJAR data reports that BBC Radio 3 has 1.95 million listeners. Radio 3 currently has 101,617 Twitter followers. Which means only 5.2% of the station's listeners follow it on Twitter. Radio 3 has ambitions to reach a wider audience. The total UK radio audience is 48.86 million. So just 0.2% of the target wider audience follow Radio 3 on Twitter. Despite these readily available statistics, Radio 3 continues not only to use Twitter to influence programming, as in the case of the infamous Hovis tweet and the new example above, but unashamedly grovels to Twitter users for approval, see tweet below. Daytime BBC Radio 3 is now a sequence of bleeding chunks of symphonies and concertos punctuated by the presenter's desperate pleas for interaction from the social media 5%. And if you think that description is extreme please read again the tweet below. To the other 95% of its audience Radio 3 now sounds like a spoilt child craving attention and approval. So hardly surprisingly, a significant proportion of the 95% - 169,000 listeners in the last 12 months - are voting with their feet. 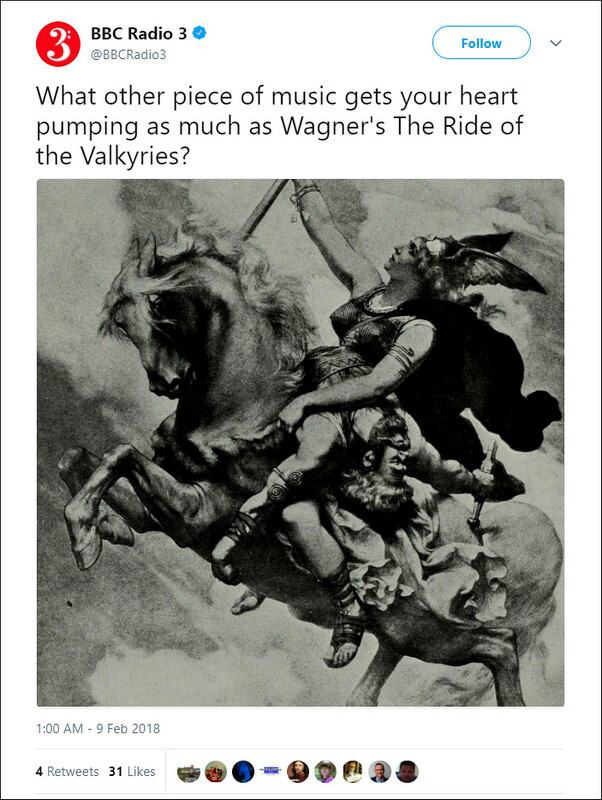 Things are only marginally better in the evenings, when worthwhile concert broadcasts are fatally marred by approval-seeking presenters adopting the vernacular of social media - "that uplifting and deeply-felt emotionally-charged live performance of Mahler's First Symphony was conducted by...."
There is a major problem besides that of small sample size with allowing a social media mindset to influence classical music programming and presentation. Responses on Twitter and other social media are self-selecting - respondents decide for themselves whether to respond. In the market research industry self-selection bias is a recognised phenomenon. To quote an academic paper: "Self-selection bias is the problem that very often results when survey respondents are allowed to decide entirely for themselves whether or not they want to participate in a survey". A poll suffering from this bias is termed a self-selected listener opinion poll or "SLOP". Social media responses to the tweet above will inevitably suffer from self-selection bias. Moreover the degree of SLOP is likely to be large. Views expressed by heavy social media users are typically highly unrepresentative and biased, because, as another study reported, the more time people spend on social media "...the more socially isolated they perceive themselves to be, and perceived social isolation is one of the worst things for us, mentally and physically". 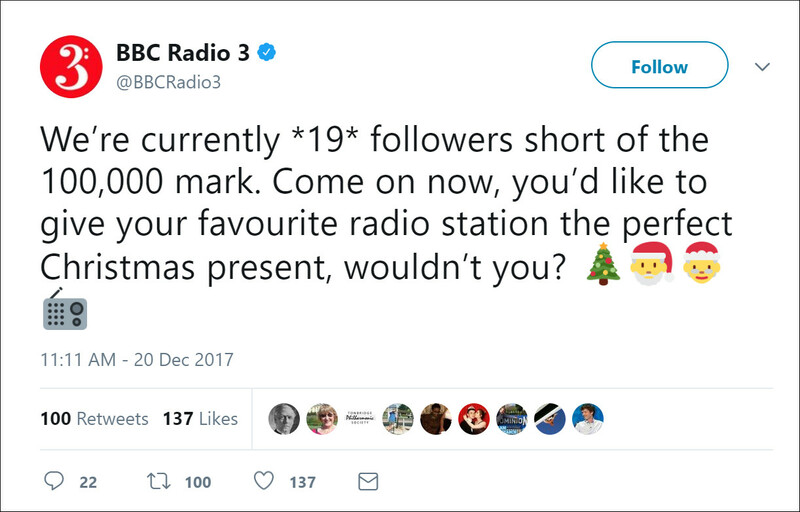 Radio 3's current social media obsession coupled with its accelerating audience loss is a graphic illustration of the important but little-understood economic concept of opportunity cost. When a benefit is derived from investment, the cost of any negative impact of delivering that benefit is the opportunity cost. The opportunity cost of building an urban motorway is the demolition of houses and the rehoming of residents. The opportunity cost of changing classical music presentation to appeal to a new audience is the proportion of the core audience driven away by the changes. Attracting an impressive number of new young listeners - a metric often bandied around in self-congratulatory press releases - is only a measure of gross audience gain. The sole meaningful measure of audience growth is the net figure: new audience minus lapsed core audience. RAJAR's latest data for Radio 3 shows that as classical music becomes increasingly desperate to reach a new young audience, so the opportunity cost increases. But when did you last hear opportunity cost mentioned in any discussion of classical music's new audience? We live in an age of instant gratification, and social media delivers instant gratification in the form of visible but highly unrepresentative responses, retweets and likes. Radio 3 may be an extreme example of social media SLOP. But the virus has spread throughout classical music where; because we live in a digital age, any digital technology is accepted - no indeed evangelised - as good without question . Social media is a useful tool in the communications toolkit. But it is no more than that. Classical music is an aspirational artform that guides its listeners on a journey upwards to a better place. Guides and upwards are the key words, and a social media mindset, with the narrative invariably being dragged down to the lowest common denominator, delivers neither. Social media responses are biased, unrepresentative and misleading. RAJAR's audience figures for Radio 3 are robust and statistically valid. Which is why they should be a wake-up call to the whole social media-obsessed classical music industry. I do try to listen to BBC Radio 3, I really do. In fact I am currently listening - 15.10h Feb 12 - to the Dream of Gerontius which the brimming with street-cred Radio 3 presenter introduced as being conducted by "Sir Edward Davis". ...and cleverly let it play on afterwards so listeners got the separate Prelude track afterwards. Inept doesn't begin to describe it.